The anchorage is in Estero Piti-Palena, behind Isla los Leones, which after a narrow entrance opens out into a bay some 4M long almost totally shut off from the sea. The mouth of Buta-Palena is over the sandbank west of Los Leones and has a bar. This is not navigable by yachts and by dinghy only at high tide and the way through the bar changes continually. Tide streams around Peninsula Coca are strong and can cause tide rips. Enter in settled weather on a rising tide to get help from the current. Swell may break on Barra, the sandbank west of Isla los Leones which is reportedly extending northwest. 1586Rada Palena light (Fl.G.5s8m3M Green GRP Tower 3m), (345°-vis-097°) is opposite the entrance to Piti-Palena. Canal Garrao provides a good route by dinghy from Estero Piti-Palena into the Buta-Palena. 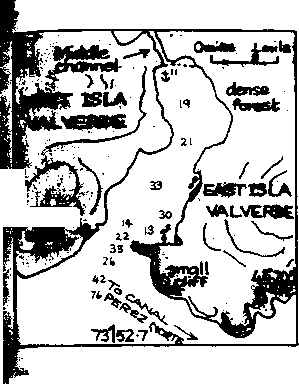 In the north-south stretch between Los Leones and the mainland, with lines ashore. Not all that good in a northerly. 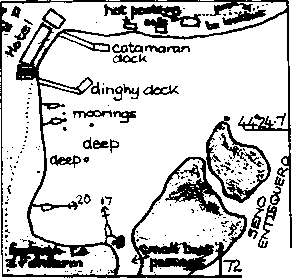 Anchoring is also possible off the village and in the main part of the Estero. The village, Raúl Marin Balmaceda, has an Armada presence. The principal Amiada stations, such as Castro, Puertos Melinka, Aguirre and Chacabuco are manned by navy personal and are known as Capitanías de Alar. 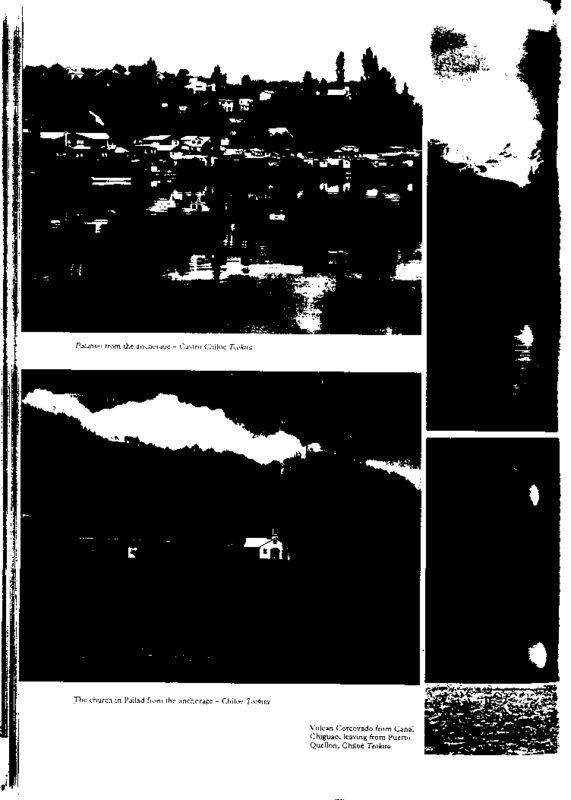 Raul Marin Balmaceda is an Alcalde de Alar and is run by an agent of the navy, in this case the police (carabineros). Some supplies in the village. Post Office, telephone. 700m airstrip. 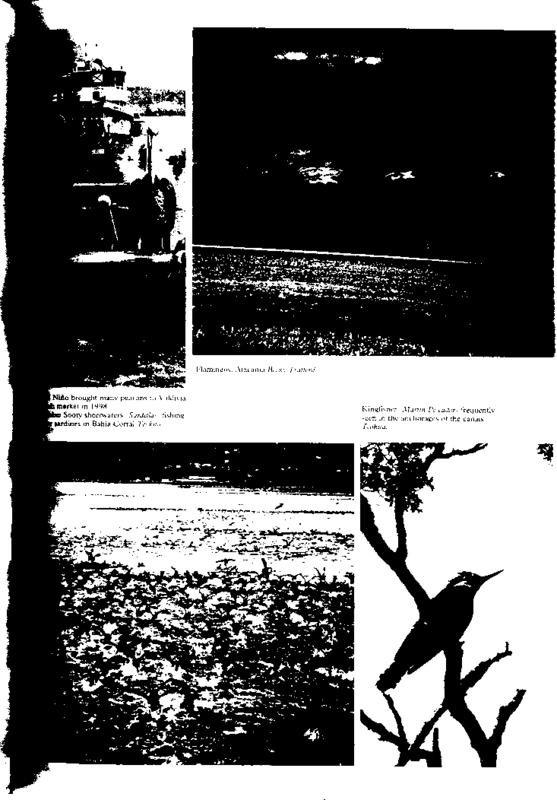 aerican/Chilean family of Juan Carlos Szydlowski are very helpful and who kindly provided the Dtographs from which the plan outline was epared. Call the Szydlowski family on Chi6 (call lue, pronounced An Knee Way) to let them ■ you would like to anchor. schorage j small secure bay with good holding but use shore ae. 1288 US 22360 Chile 716 • General uerto Santo Domingo is an inlet on the mainland : of Canal Refugio which isolates Isla Refugio. It lies behind a white beach sticking out into the canal [to the south of Morro Yelen (Yeli in the UK pilot). Anchor between the point and the lagoon with a line : ashore. Good holding. Good in northerlies but a bit exposed in southerlies. Wild strawberries on the beach in January. The more obvious route is down Canal Moraleda. However, the preferred route for yachts is down Canales Perez Norte and Perez Sur which avoid the more exposed conditions in Moraleda. 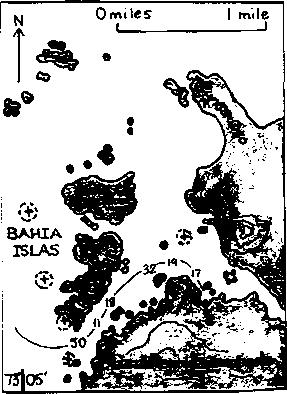 Furthermore, the route is more interesting as it winds through the islands. 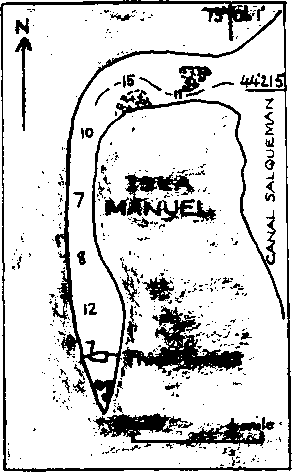 The large bay on the south side of Isla Amita may be handy for those using Canal Perez Norte or Canal Tuamapu. The entrance is narrow but well marked by the large islet and three smaller islets lying off the entrance - see plan. The bay is well sheltered, 10-12m, mud. A small bay on the east side has been used to give overnight shelter in a strong northerly, 8m good holding. This is an attractive anchorage in the W end of Canal Jacaf. It is a small bay slightly W of Punta Porvenir, north of Isla Wargny and east of the Islas Gala. The bay can be identified by the beach and waterfall at its head. There are rocks off the west entrance point. The bay is deep and shelves very steeply close to the beach. It provides good shelter, though with some fetch with wind in the S. Anchor in 12-18m, close to the beach. 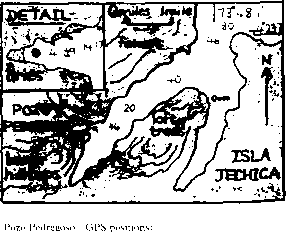 Isla Gemmel is on Canal Jacaf, east of Isla Manuel and of the rock in the channel, Roca Robinet, and north of Isla Suarez. The anchorage has good protection from north through west to south but is a bit difficult to find. Once in, anchoring and passing lines is done in flat water even in the heaviest winds. 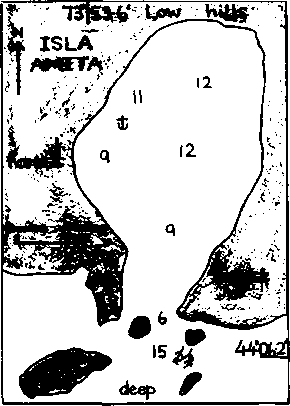 Anchor in 10-12m with lines ashore. excellent shelter from all but east winds. Lines ashore were not necessary. 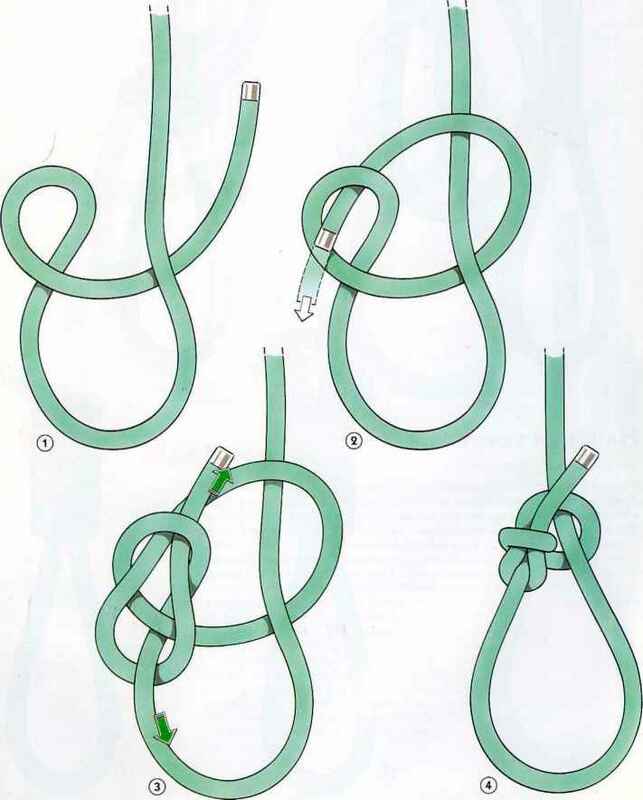 Good holding in 7-15m. 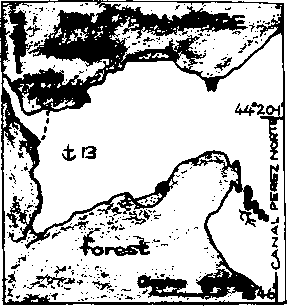 The small islet shown on the plan is in fact a peninsular at low water. Approach on a SW heading to avoid rocks along the southern shore. 44°20'-5S 73°52'-7W (at the southern entrance to the Estero). v tnorth/south canal. The southern Estero has two good anchorages, which make good stopping places or before Canal Skorpio. The northern bay is ipretty and well-sheltered. It can be reached from lEstero Picalito by dinghy or from the north by a ¡[channel with minimum depth of 3-5m. |Anchorage mnchor with shore lines near the entrance of the HBstero to the north and east of a small island or at phe head of Estero Picalito in 10m, good holding. ¡^Founded in 1935 by Germans, Puerto Puyuguapi at Lthe head of Seno Ventisquero has about 1000 habitants and serves a cattle farming community, no Ventisquero (ventisquero is glacier) starts at the action of Canales Jacaf and Puyuguapi, at the ortheast corner of Isla Magdalena. The town has a ■wmill, a famous carpet factory and a small ospital. Try the pier in the northwest corner with i depth or anchor off. Don't stay the night - there no protection from the southwest; try Bahia »Dorada (3-13). Diesel by cans, fresh water and some ¡«provisions. 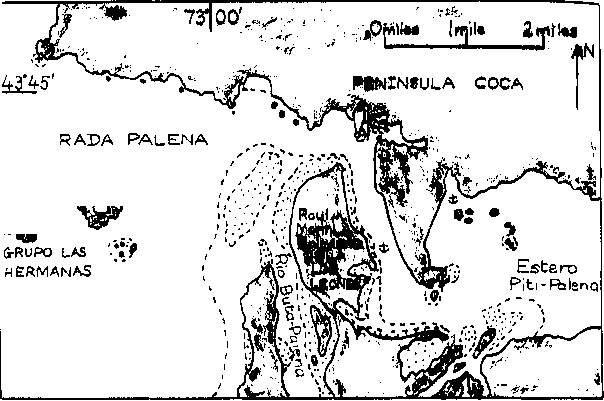 Bahia Dorada is on the northwest shore of Seno Ventisquero (see 3-12 Puyuguapi above). The hotel, Hotel Termas, is a five star resort hotel with thermal pools, float planes to fly to the lakes for the fishing and prices to match. The bay is easily entered from the east, north of the two islets which protect it from the Seno but in poor visibility the bay may be difficult to spot as the point to the north is not obvious. Visiting yachts may use all the facilities (including the laundry); the atmosphere is friendly and informal. In 1998 a mooring was 5000 pesos a night, the thermal pools 10,000 pesos a day. Anchoring is difficult because of the depth but a tie-off in the southwest corner should be possible in most conditions. Diesel can be purchased. Launch service to Puyuguapi airfield, 9km south of that town. A secure anchorage, sheltered from all winds with well-wooded shores providing protection and good tie-off points. This cut between Isla Jechica and Pen-Davis saves about 5M and is used by the commercial catamaran, Patagonia Express, with a draft of 2m. The west arm of Canal Skorpio is foul but the east arm, in pleasant weather, makes a delightful short-cut. Entering the east arm from the north depths quickly fall from 50 to 18m as the Canal narrows and then to 5-7m as the yacht travels over the first sand bar. 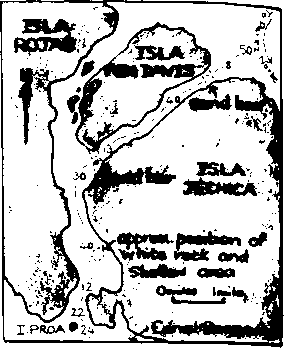 Soundings on the plan were taken at half tide and the channel should be taken centrally; the bouom can be clearly seen and there is neither obvious obstruction nor kelp. The Canal quickly widens and deepens and is clear. At the southern end of the east arm where it joins up with the west arm is another sand bar. This should be taken centrally; the shallow areas are visible as depths fall to 4-6m, again without kelp. Once the bar is passed the Canal quickly deepens to form a wide Canal. 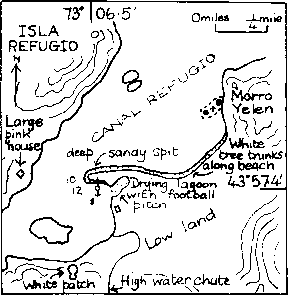 At the southern end of the main Canal depths fall to a minimum of 10-12m until the Canal widens out and Islote Proa is left to starboard.